Following the horrific murder of his entire family, a toddler wanders into a dis-used graveyard populated by ghosts and other undead creatures of the night - completely unaware of the death of his parents. Taking pity on the innocent child the ghosts agree to raise him as their own, naming him Nobody Owens and giving him the freedom of this eternal home. Growing up in a sprawling graveyard - now used by the locals as a "beauty spot", Nobody (Bod to his friends) is educated by ghosts and looked after by a solitary guardian who skirts the void between the living and the dead. There are plenty of distractions and adventures for a growing boy but if Bod ever left the graveyard, he would risk coming under attack from a man called Jack, the man who has already killed Bod's family and still looks to complete the job. I have yet to read anything by Neil Gaiman that I didn't like, American Gods and Neverwhere are both favourites of mine while Good Omens co-written with Sir Terry Pratchett was just fantastic. 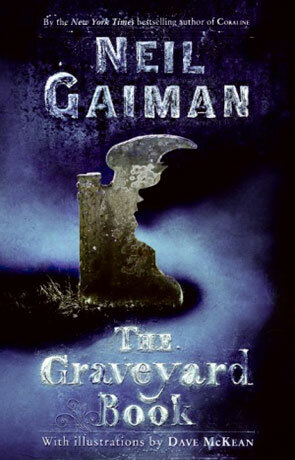 The Graveyard book was released in 2008 and received critical acclaim, winning the Newbery Medal, the Locus Award, the Carnegie Medal and the much coveted Hugo award. The main reason I am reading this now is due to that last award, a self imposed desire to read each and every Hugo winning novel (although I would have got round to reading it at some point anyway) It's one of the only Young adult novels to ever win the Hugo. Although this book is clearly written for the younger reader and has an uncluttered style it doesn't fall foul of the all too often made mistake of dumbing down the prose which usually ends up coming across as patronising. Instead the reader is treated with intelligence and respect resulting in a novel of quiet intensity that should appeal to both children and adults - young or old. "There was a silent implosion, a flutter of velvet darkness, and Silas was gone". The story itself is a meandering tale of this boy growing up in a graveyard and looked after by benevolent ghosts and other undead; his guardian "Silas" cutting a very enigmatic figure - a benevolent yet flinty mentor who clearly cares a great deal for his charge. The juxtaposition of the main antagonist "Jack" as a dark, elusive and creepy figure who seems to possess strange powers and clearly has a dangerous and evil motive to the murder of Bod's family fits very well, I loved how Gaiman has made the real monster a man while the traditionally evil ghosts and (some) undead are the good guys. At it's heart The Graveyard Book is a classic coming of age story inspired by Rudyard Kipling's The Jungle Book, but one with an incredible sense of depth and power, set against a weird backdrop of otherworldly creatures and magic; told by a gifted storyteller with tight prose, a fast pace and a very easy reading style - a highly entertaining read for all ages. Written on 6th February 2013 by Ant.